Vocal Jazz, with a Swing specialty, is the chosen medium of these 5 artists, two baritones and three sopranos. 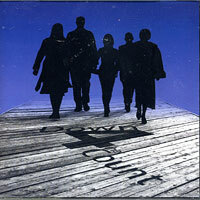 The group got their start at Cal State University Northridge in 2003, and "Down 4 The Count" is their debut CD. There are 11 songs, favorites are "Down For The Count," "No More Blues," the funny, manic "Whirlybird" with lyrics by group member Colleen Keene, the "Train Song," "Hernando's Hideaway," the poignant "It's Not Easy Being Green," "Blame It on My Youth," the dynamic "Shut Up," and Jimi Hendrix's "Crosstown Traffic, with faux electric guitar and a very commendable Hendrix imitation. At times dissonant and moody, at times joyously powerful, "Down 4 The Count" is very good stuff, an impressive debut for this talented, attractive group!